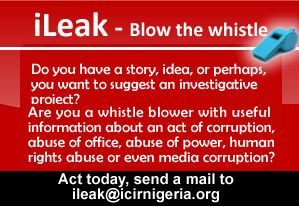 THE African Centre for Media & Information Literacy (AFRICMIL), has charged the federal government to protect whistleblowers for the policy to be effective. This was made known at the presentation of a publication commemorating one-year of the Corruption Anonymous project of the Centre. In its quest to engage civil society and Nigerians in general in tackling corruption, AFRICMIL officially unveiled Corruption Anonymous in Abuja on Thursday, October 12, 2017. While delivering his speech, the chairman of the event, Mallam Nuhu Ribadu, former Chairman, Economic Financial Crimes Commission (EFCC) said the government and the public must form a synergy in the fight against corruption so as to build public trust and have integrity in the system. “The importance of the government/people synergy in the fight against corruption is best measured by the trust people have in the integrity of the system. The manifestation of that trust, in turn, is when people go beyond expressing verbal support for the work to volunteering tips and information. “Giving information about crimes to law enforcement agents is a constitutional role of the citizen. “In fact, to do otherwise is not only unpatriotic but a punishable offence. However, Nigerians are often reluctant to play this role for a number of reasons. “It is not because they are not patriotic. Anytime people see public officers who are serious about their task or a government that is committed, you see a surge of interest on the part of the public to contribute their quota to make the system work,” Ribadu said. Chido Onumah, Coordinator, AFRICMIL said in his welcome address that the Centre has engaged the whistleblower process in the last one year and has intervened on behalf of whistleblowers who were victimized by their employers. “Four cases come to mind in this regard — Mr. Ntia Thompson who was sacked for blowing the whistle on corruption in his unit at the Ministry of Foreign Affairs, Mr. Aaron Kaase of the Police Service Commission (PSC) who was suspended in May 2015 for raising questions about financial impropriety involving Mr. Mike Okiro a former Chairman of the PSC. “Mr. Murtala Ibrahim of the audit department of the Federal Mortgage Bank of Nigeria (FMBN) who was sacked for exposing fraud at the bank and Mr. Joseph Babatunde Akeju, Chief Lecturer, Department of Accountancy, Yaba College of Technology, Yaba, Lagos, who was to officially retire from service on March 20, 2018, at the age of 65 years, but was dismissed by the Governing Council of Yaba College of Technology headed by Prince Lateef Fagbemi, a Senior Advocate of Nigeria, SAN, on March 7, 2018, after he petitioned the EFCC about corruption in the institution,” Chido said. between 2.5 per cent to 5 per cent of the amount recovered. In December 2017, the whistleblower who provided information that led to the recovery of about N13 billion from a residential apartment in Ikoyi, Lagos, was paid. However, the specific amount paid to him was not made public. In May 2018, another 14 persons who gave useful tips that led to the recovery of several billions of Naira and some millions in hard currency from some corporate tax evaders were paid about N439.3 million.